Activision and Treyarch have announced the next Call of Duty: World at War map pack. Aptly titled "Map pack #3" - the map pack will contain three new multiplayer maps and one new zombie map. The maps were co-developed with Certain Affinity, makers of Age of Booty. The new co-op zombie map is called Der Riese and unfortunately we don't have a new screen of it in action. So enjoy a screen from one of the new multiplayer maps called Battery. The maps are expected to hit this August for the normal $10 price point. 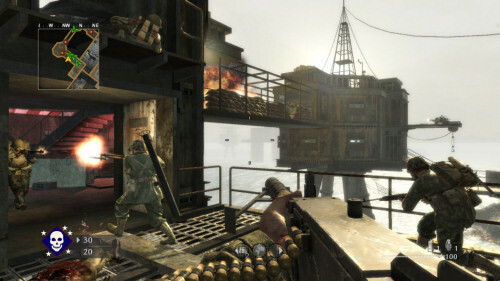 Don't forget that tomorrow is our Call of Duty: World at War co-op night on the PC!